MOST, if not all, students of culinary schools go in with a dream of running their own restaurant someday. Aaron Lim, managing director of Fishbowl Ventures Sdn Bhd, was no different. So after he graduated from culinary school, he tried to work his way up in the kitchen. He worked in F&B outlets and spent some time learning in the kitchens of France. But not long after, he found that he could not take the kitchen anymore. “Fed up” with cooking, Lim turned to a sales job for solace. He survived in sales for two years before going back to making food. In 2016, the 28-year-old was introduced to the poke dish. Poke, pronounced poh-kay, is a Hawaiian dish that refers to the cuts of raw fish that top a typical poke bowl of hot rice and a variety of sides. The word “poke” means to cut or slice, and the dish originated from the odd off-cuts of a fishing catch – waste not, especially when you can season and enjoy it with a little sea salt or soy sauce. “Initially, I didn’t like the concept. Hot and cold food served together was a no-no for me. But my friends brought me to try it in Singapore because we did not have it here at that time. And I found that I really like the taste. It was healthy. And I liked it,” he says. Lim figured this could be his opportunity to finally run his own restaurant and decided to build a venture around the poke dish. He toyed with the idea of bringing in one of the poke-centric franchises from Singapore, but decided to experiment with a homegrown brand of his own instead as it was “very doable”. Once he got his menu set, Lim and his partners – friends, in his case – put in a total of RM160,000 to set up their first outlet in Sunway. The big student population in the area seemed a natural market to tap into for something as hipster-ish as the poke. The first The Fish Bowl outlet opened in August 2016. However, the first few months didn’t go by smoothly. “We struggled the first few months. No one knew what poke was. We had to educate people about what poke was all about. And at that time, Pokemon Go was a big hit, so people thought we were related to the game. And when they find out we are not, they’re not interested to come in,” says Lim. When November came rolling around, the surrounding universities were closed for the holidays. The area was dead quiet and the lull lasted till the Chinese New Year period. “It was tough, but we still had to go on with the business because we had already put in so much effort into this shop,” states Lim. Fortunately, things started to look up after the festive season early last year. Lim also implemented several changes to its menu and food presentation based on feedback from some of their customers, which helped grow their customer base. “From the time we started, I learned a lot about consumer behaviour and tastebuds. And that helped us create our own menu along the way,” he says. Another thing he learned was to manage people, particularly a team with different nationalities. “There’s a language barrier. But you have to learn to be patient with people and to teach them how to work in a kitchen because some have no experience in a kitchen,” he adds. The company currently has about 60 employees, including its staff at the restaurants. What surprised Lim once there was an uptick in the business was its weekend crowd – they mainly consist of families. That meant The Fish Bowl’s offerings appealed to a wider market than just its weekday student crowd. Subsequently, he decided to explore expansion opportunities in shopping malls. Although rentals were higher, so was foot traffic. Lim was also lucky to have the support of a new investor, which gave Fishbowl Ventures the deep pockets it needed to expand The Fish Bowl chain quickly. Lim notes that the cost to set up an outlet is about RM250,000 to RM300,000. 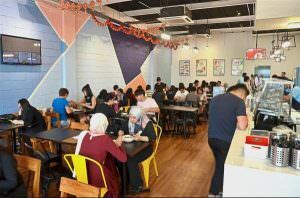 The Fish Bowl opened its second outlet in 1 Utama Shopping Centre in April 2017 followed by another two more, in Pavilion KL and Plaza Arkadia, later in the year. It opened its fifth outlet this month and the company is looking to add another four more stores this year. Is it, perhaps, growing too aggressively for a poke restaurant? Not really, says Lim. He thinks it is a good way to capture the market “while it is still hot”. He adds that there is still plenty of room for growth as a lot of people still don’t really know what poke is all about. But while it is a growing trend now, he insists that The Fish Bowl cannot remain as just a trend. “The challenge for us is that people think this is just a trend. I hope there will be more poke restaurants that will come into the market to increase awareness on the poke dish. At the moment, there are about six to seven other players. 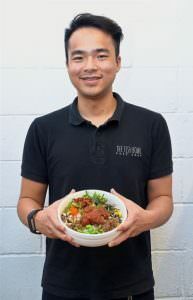 “There’s a lot of potential for poke because Malaysians like Japanese food and that helps a lot because the poke has similarity to Japanese food,” he says. Last year, Fishbowl Ventures turned in revenue of about RM1mil. With his line-up of store openings, Lim is expecting revenue to double by the end of the year. 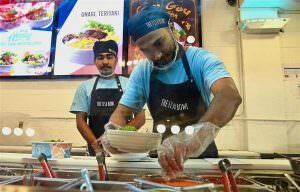 But he acknowledges that the F&B market is a competitive one. It is a lot easier to start a food business these days because of alternative models such as food trucks and pop-up stores. It is also a lot harder to sustain a food business today because there are more players in the market, which also puts a lot of pressure on margins. While others focus on margins, Lim pays more attention to his volume. He thinks that by being genuine and generous about their portions, he’d have a better chance at sustaining his customer base, thereby growing his volume. The Fish Bowl will also introduce more side dishes and mains in the coming months to sustain interest in poke. As more players offering poke come into the market, The Fish Bowl is not about to sit back and be just one of the restaurants, says Lim. He wants to be a benchmark for the market, much like how Starbucks has become a recognisable brand in the coffee market. He hopes this becomes a reality in a year’s time once more of its outlets come on stream. He is also eyeing the market outside of Klang Valley, with plans to open outlets in other states like Penang and Johor by next year. One of his other challenge in growing the business is the uncertainty in the ringgit as most of its materials are imported. “You need to have a good connection with your suppliers. I work very closely with them to control the stock that we get because we can’t pass the cost on to our customers,” he says.